Google Reviews Often Inaccurate for HOA Companies - Advanced Management Inc.
Have you ever left a Google review? Maybe you had outstanding service at your auto mechanic or a business contacted you after an interaction to request that you leave one. That’s because Google reviews can be powerful forces in helping people make decisions about who they want to work with in various aspects of their lives. Unfortunately, Google reviews aren’t always accurate, especially when it comes to HOA companies. Only approximately 1.5% of people leave reviews at all. Most of us just don’t bother. We have busy lives to lead and we don’t really want to get bogged down trying to write a review when we can just go use the product and enjoy our lives. Also, writing is hard for a lot of people. It takes the kind of time and focused energy that most of us just don’t have a lot of. This means that many of those who do leave reviews end up being people who are unhappy with something. They are likely the only ones who have enough energy to focus, sit down, and write out their words. This is true no matter what industry you’re in – people who interpret an interaction or a product negatively are significantly more likely to share that. What Is a Negative Experience? When it comes to HOA management, the waters can get even muddier. Some people interpret an experience as “bad” whenever it is negative for them, even if they played a part in their own misery. Think about a police officer who pulls someone over for dangerous driving. The driver was legitimately endangering others on the road, yet he will probably interpret the experience as negative, especially if he receives a ticket or gets arrested. That doesn’t mean that the officer wasn’t doing his job, though, because the person made his own choices leading up to their interaction. HOA management companies often find themselves in similar circumstances. They are the ones who do all of the “dirty work” for the association. They enforce the rules, make people pay fines, request assessments, and more. All of these are things that homeowners supposedly want the company to do, since they bought a home inside the HOA. However, when that applies to them, they can interpret the experience as negative even when the management company is simply doing its job. Instead of choosing an HOA management company based off its reviews, call up representatives from the company and talk to them. If the negative reviews are bothering you, ask about them. Most of the time, the company will be happy to tell you exactly what led up to that negative review, and you may be surprised to find that the full story is different from what you read online. 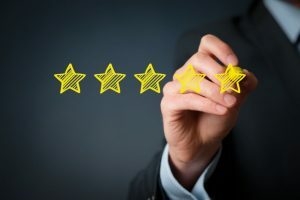 Most good HOA companies will probably have some negative reviews, simply because they can make people angry in the course of doing their jobs well. That’s why it’s important to find out the back story behind any negative reviews before you choose your HOA management company.